\ '); }); Spring is in the air! Home > Specials > Spring is in the air! Spring is finally here, but that often brings a host of fresh allergens blooming all around us. Before it has a chance to wreak havoc on your respiratory system, get to Himalayan Hideaway Salt Cave and breathe easier this season. You will be amazed at what the salt treatment can do and the tea room will leave you restored from your excursion. Relieve sinus pressure, open up your airways and breakdown mucus. Rest your feet on warm detox salt domes to improve circulation, reduce pain and swelling in your feet, and pull toxins out of your body. Reinvigorate with a cup of immune boosting tea. All of our tea is hand-picked from Nepal, high in anti-oxidants and chemical free. 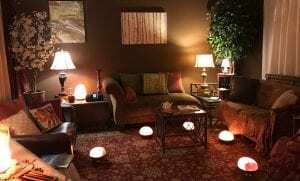 Our cozy tea room is a great place to gather your thoughts and soak in your experience after a session. "I made a surprise appointment for myself and some friends, not knowing really what to expect, but I had done some research of how beneficial salt caves can be. This experience was WAY above and beyond what we all could have ever expected. The staff, owner, cave, tea room, everything was so warm and inviting. We walked out of there so much more relaxed and definitely believers!" 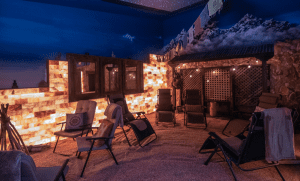 Winter is finally behind us, so come rejuvenate your mind and body at our salt cave! Check availability on our calendar and book your session today.